Color: Green -Description: Green hooded coat, with closure with zip, gathering waistband with inside coulisse and side pockets. 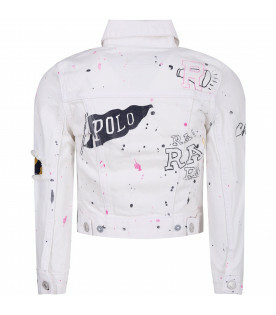 It is embellished with iconic logo appliqued on the sleeve. - Details: 100% Polyester. Machine wash at 30°C. 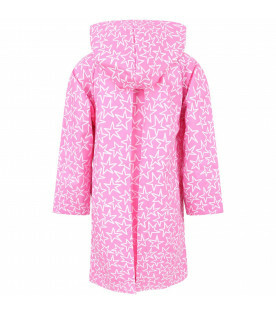 Color: Fucshia -Description: Fucshia jacket with hood, soft, natural down feather padding and zip closure on th front. Side pockets zip and elasticated cuffs. Iconic rubbered logo on the sleeve. -Details: 100% Polyester, padding 90% Duck down 10% Duck feathers. Wash at 30° C.
Color: Pink and black -Description: Pink and black checked jacket with turtleneck, frontal pocket, closure with zip, on the front and elasticized waistband and on the cuffs. 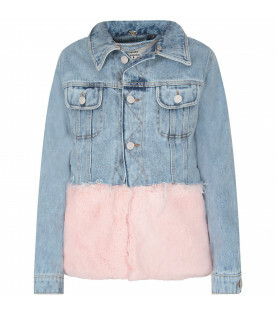 It is embellished with neon pink logoo, on the front. -Details: 50% Polyamide 50% Polyester. 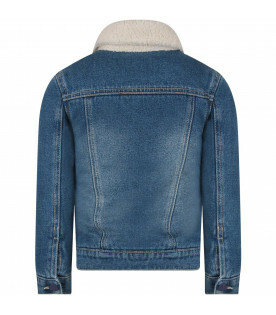 Hand wash.
Color: Light blue -Description: Light blue denim jacket with double classic collar, two pockets with frontal flap with button and closure with butttons on the front. 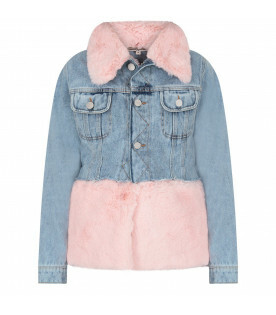 It is embellished with pink removible fur. - Details: 100% Cotton. Dry clean only. 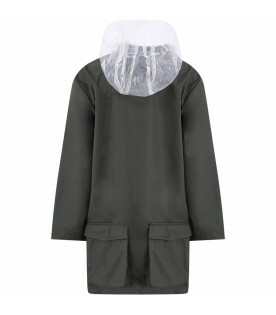 Color: Black -Description: Black windbreaker with hood, long sleeves, side pockets with press-studs and closure with zip, on the front. 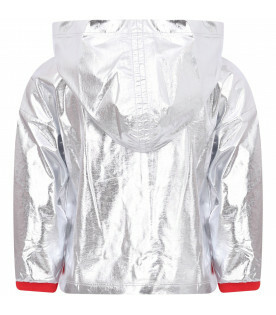 It is embellished with iconic metallic logo, applied on the hood. -Details: 100% Polyurethane. 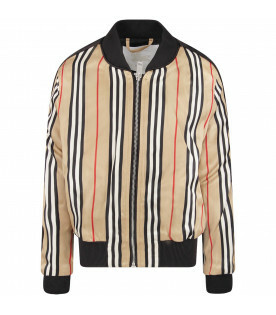 Hand wash.
Color: Gold -Description: Gold jacket with crew-neck, long sleeves, side pockets and closure with diagonal zip, on the front. 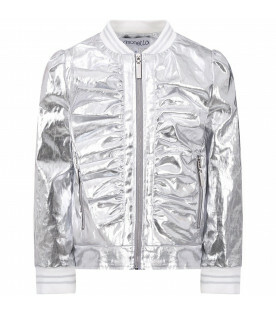 It is embellished with metallic logo, apllied on the front. - Details: 100% Polyester. Dry clean only. 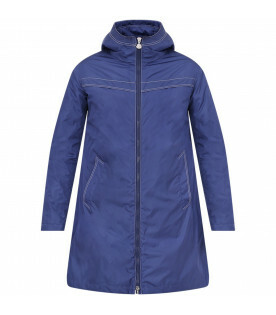 Color: Bluette -Description: Bluette quilted jacket with hood, closure with zip and side pockets with invisible zip; orange iconic rubbered logo appliqued on the sleeve; it is padded with Plumtech, synthetic heat wadding, made respecting environment and animals; it is breathability, heat-retaining and pockatable, in fact it comes in a comfortable bag, where put it for carring. -Details: 100% Nylon (Main fabric). 100% Polyester (Filling). Machine wash at 40°C. 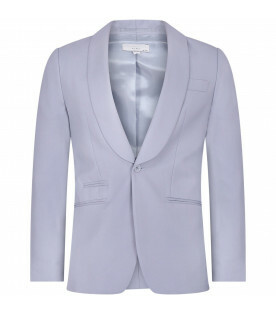 Color: Light blue -Description: Light blue jacket with collar, closure with botton, side slot pockets, breast pocket and rips on the back. -Details: 100% Wool. Dry clean only. 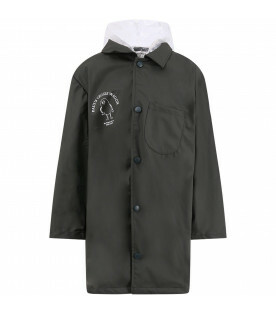 Color: Military green -Description: Military green parka jacket with hood, closure with press-studs and zip, side pockets with press-studs, on the front. 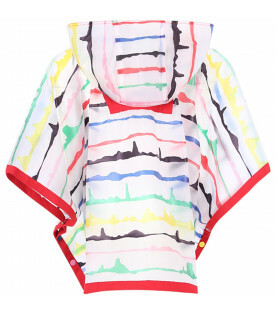 It is embellished with grey all-over print and colorful logo, apllied on the back. - Details: 98% Cotton 2% Elastan. Machine wash at 30°C. 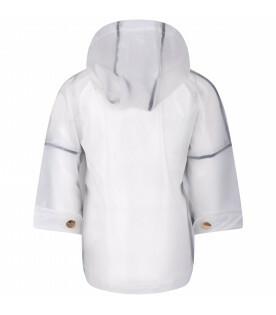 Color: Celar - Description: Celar raincoat with hood, side pockets and closure with zip, on the front. It is embellished with white and gold flowers applied, on the front. -Details: 100% Polyurethan. Machine wash at 30°C. 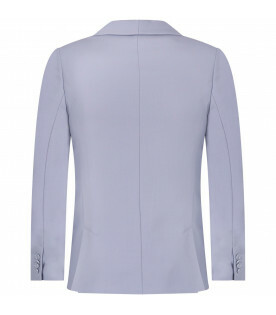 Color: Light blue -Description: Light blue cropped jacket, with classic collar, short sleeves and double double-breasted closure with pink logoed bottons, on the front. -Details: 100% Cotton. Machine wash at 30°C. 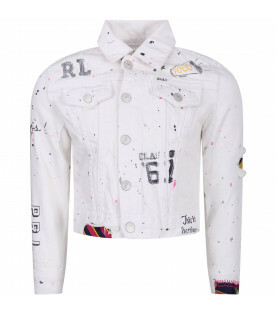 Color: White -Description: White denim jacket, with classic collar, closure with metallic press-studs on the front and breast pocket with press-stud. 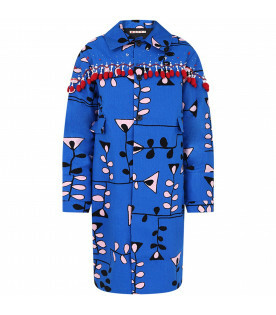 It is embellished with colorful prints and writing all-over. - Details: 100% Cotton. Machine wash at 30°C. Color: Pink and orange -Description: Pink bomber jacket with orange sleeves, old school collar, side front pockets and press-studs closure, on the front. It is embellished with orange iconic tigers, on the front and orange embroidered roaring tiger with logo, on the back. -Details: 100% Polyester. Machine wash at 30°C. 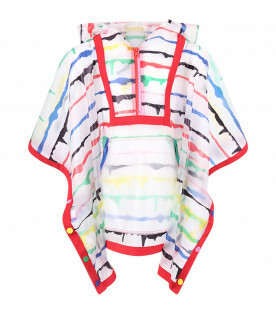 Color: Multicolor -Description: Colorful windbreaker, with hood, long sleeves, black elasticized waistband and cuffs with grey logo, side pockets and closure with zip, on the front. 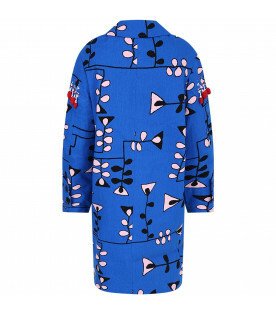 It is embellished with colorful brand's iconic print. -Details: 100% Polyamide. Machine wash at 30°C. 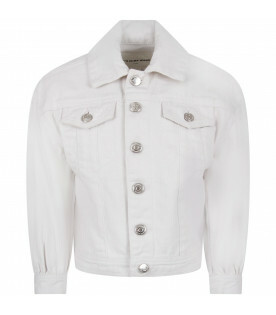 Color: White -Description: White denim cropped jacket, with classic collar, closure with metallic button on the front and breast pocket with buttons. It is embellished with iconic D, on the back and ruffles on the bottom. - Details: 98% Cotton 2% Elastan. Machine wash at 30°C. Color: Coral -Description: Coral quilted jacket with ribbed old school collar, closure with zip and side pockets; it is embellished with iconic logo in a contrasting white and logo, on the front. - Details: 100% Polyamide (Main fabric). 90% Down 10% Duck feather (Filling). Hand wash.
Color: Beige -Description: Beige bomber jacket with ribbed old school collar, elasticized cuffs and hemline; closure with zip and side pockets with zip on the front; it is embellished with iconic metallic logo on the front and pacth shaped like star, on the sleeve. 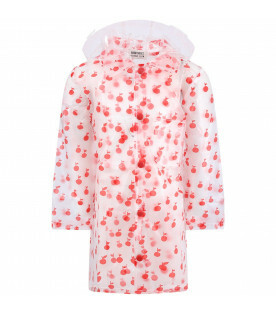 - Details: 100% Polyester (Shell) 100% Polyamide (Lining). Dry clean only. 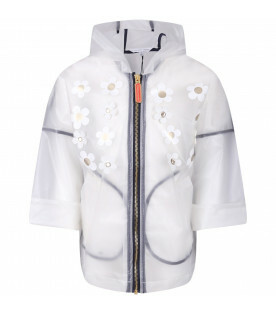 Color: White -Description: White quilted jacket without hood, closure with zip and side pockets with invisible zip; orange iconic rubbered logo appliqued on the sleeve; it is padded with Plumtech, synthetic heat wadding, made respecting environment and animals; it is breathability, heat-retaining and pockatable, in fact it comes in a comfortable bag, where put it for carring. -Details: 100% Nylon (Main fabric). 100% Polyester (Filling). Machine wash at 40°C. Color: Red -Description: Red quilted jacket with hood, closure with zip and side pockets with invisible zip; orange iconic rubbered logo appliqued on the sleeve; it is padded with Plumtech, synthetic heat wadding, made respecting environment and animals; it is breathability, heat-retaining and pockatable, in fact it comes in a comfortable bag, where put it for carring. -Details: 100% Nylon (Main fabric). 100% Polyester (Filling). Machine wash at 40°C. Color: Grey -Description: Grey quilted jacket with hood, closure with zip and side pockets with invisible zip; orange iconic rubbered logo appliqued on the sleeve; it is padded with Plumtech, synthetic heat wadding, made respecting environment and animals; it is breathability, heat-retaining and pockatable, in fact it comes in a comfortable bag, where put it for carring. -Details: 100% Nylon (Main fabric). 100% Polyester (Filling). Machine wash at 40°C. Color: Neon yellow -Description: Neon yellow jacket, with classic collar, closure with metallic button on the front and on the cuffs, and fringed hemline; breast pocket with buttons and wripped holes. It is embellished with white patch wih black logo, on the sleees and white and neon yellow logo, on the back. - Details: 100% Cotton. 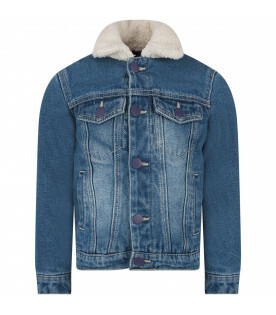 Hand wash.
Color: Blue -Description: Blue denim cropped jacket, with classic collar, closure with metallic button on the front and breast pocket with buttons. 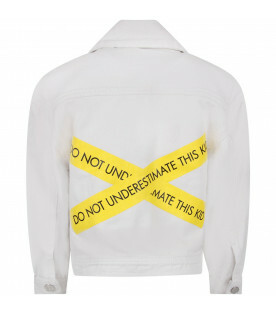 It is embellished with white all-over logo. - Details: 100% Cotton. 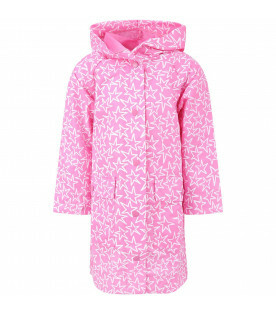 Hand wash.
Color: Pink -Description: Pink raincoat with hood, long sleeves, flapped pockets with press-stud and closure with press-studs, on the front. It is embellished with white all-over stras. -Details: 100% Polyrethan. Machine wash at 30°C. Color: Royal blue -Description: Royal blue jacket with classic collar, long sleeves, flapped pockets and closure with bottons, on the front. 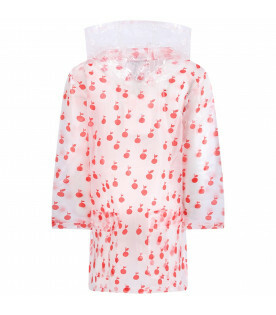 It is embellished with white pearls and sequins, red decorations and pink and black prints. -Details: 100% Cotton. Machine wash at 30°C. Color: Black -Description: Black bomber jacket with hood, long sleeves, flapped pockets, on the frront, elasticized waistband and cuffs and clousre with zip, on the front. 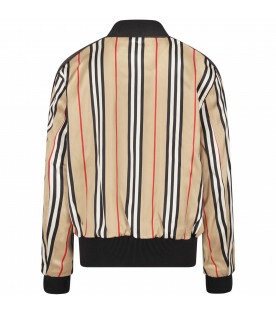 It is embelished with grey embroidered logo and tiger, on the back. -Details: 59% Viscose 41% Acetate. Dry clean only. 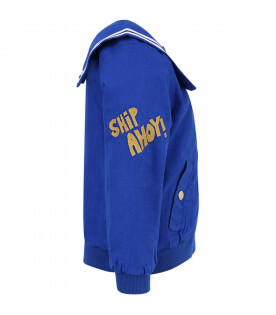 Color: Blue and gold -Description: Reversible gold jacket on one side and blue on the other side, with long sleeves, side pockets and ribbed old school collar. 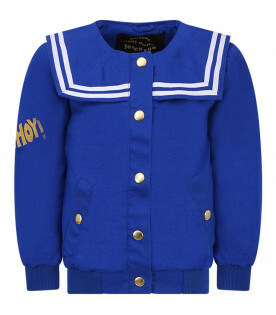 Blue jacket embellished with gold embroiderd writing on the breast and colorful embroiderd logo, on the back. - Details: 100% Polyester. Machine wash at 30°C. 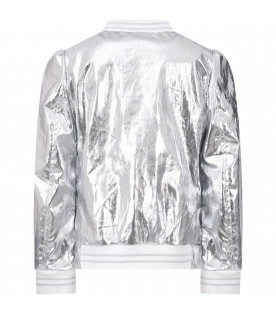 Color: Silver -Description: Silver bomber jacket with long sleeves, side pockets with zip and white ribbed old school collar, cuffs and hemline. It is embellished with ruffles, on the front. - Details: 100% Linen. 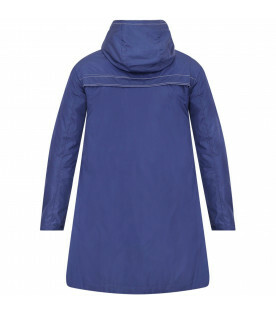 Hand wash.
Color: Blue - Description: Blue hooded coat, lightly padded; closure with zip, side pockets and black detachable belt; iconic logo appliqued on the sleeve. - Details: 100% Polyamide (Main fabric). 90% Down 10% Feather (Filling). 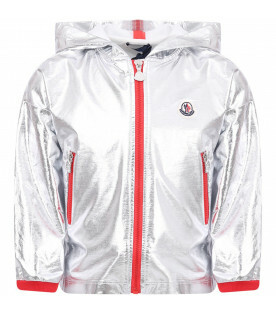 Hand wash.
Color: Silver - Description: Silver hooded jacket, with details in a contrasting red; closure and side pockets with zip; side pockets and iconic logo appliqued on the breast. - Details: 94% Cotton 6% Elastan. 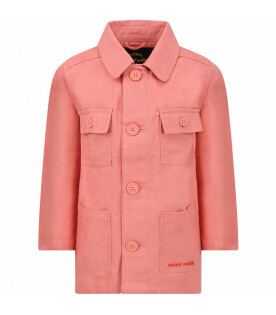 Hand wash.
Color: Pink -Description: Pink jacket with classic collar, four pockets with buttons and closure with buttons, on the front; made from organic cotton. 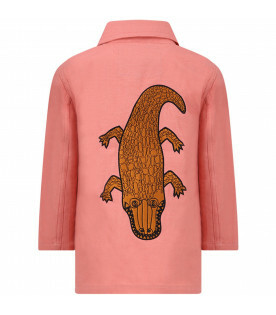 It is embellished with red embroidered logo, on the front and brown and black patch shaped like crocodile, on the back. -Details: 100% Oragnic cotton. Machine wash at 40°C. 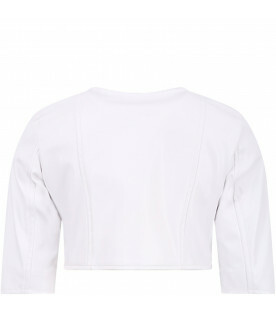 Color: White -Description: White faux leather cropped jacket, with zip on the front and snap on the shoulder. - Details: 57% Polyester 43% Poliurethan. Dry clean only.